I know I'm a little late with this, as there's only really New Year's left of the *Holidays* but I only started up this food blog yesterday so it's the best I can do. 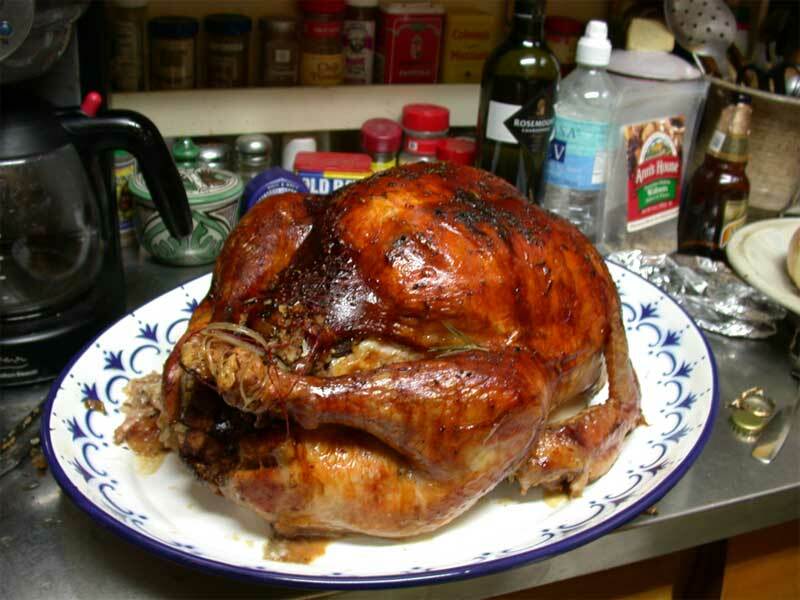 click to enlarge Oven roasted and stuffed 22 lb turkey. It's pretty easy to roast a turkey, just by following the instructions on the wrapper around the bird. I always by a fresh, young, and not frozen turkey. Wash the bird inside and out and salt the interior liberally. Bake in a 325º oven for 20min per pound, OR use a meat thermometer. Stick it into the fleshy part of the bird and wait till the needle reaches the poultry setting. Many of today's turkeys come with the pop-up indicator, so that makes it even easier. Baste often with the pan juices. I sew the bird up with waxed linen thread after I stuff it, to really seal in the juices. I like my stuffing inside the bird, but I also bake a dish of the stuffing outside the bird for those who like it that way. My stuffing consists of chopped celery (including leaves) chopped cilantro (half a bunch) and onions, browned loose sausage, salt, pepper,fresh rosemary, a pre-cubed bag of seasoned stuffing, and sometimes raisins or chopped walnuts. Everything except the bread cubes can be prepared in a food processor. Mix together and stuff or bake. Last year I made this great soup. I take a big butternut squash and halve and seed it, brush the cut side with veg. oil and bake in a 350º oven until a fork easily pierces into it. Probably about 40 min. but check at 20min. Let it cool, scoop out the flesh and set aside. Chop a large onion and saute in olive oil along with some chopped cilantro (about 1/2 cup). Add this to the butternut squash, along with a 1 qt box of chicken stock, and 1 cup of peanut butter. Puree everything in batches in a blender and mix together in a large soup pot. Add 1/2 tsp salt (more to taste if needed), 1/2 tsp curry powder, 1/4 teaspoon of ground nutmeg. Adjust to your taste as necessary. The recipe for the cranberry orange relish I make used to always be package of Ocean Spray cranberries, but this year it wasn't. It's easy, though. Wash the cranberries, cut up one large navel orange (skin and all- but remove seeds) add a cup of sugar and process in the food processor. It must be because it was my first time and I didn't screw it up. Much.